They were protesting anti-LGBTQ Republican politicians, including a congressman and a candidate for Georgia governor. Several trans activists were removed by Georgia state troopers during a Savannah rally for Brian Kemp, the Republican candidate for governor, where Vice President Mike Pence was speaking Thursday, Project Q Atlanta reports. 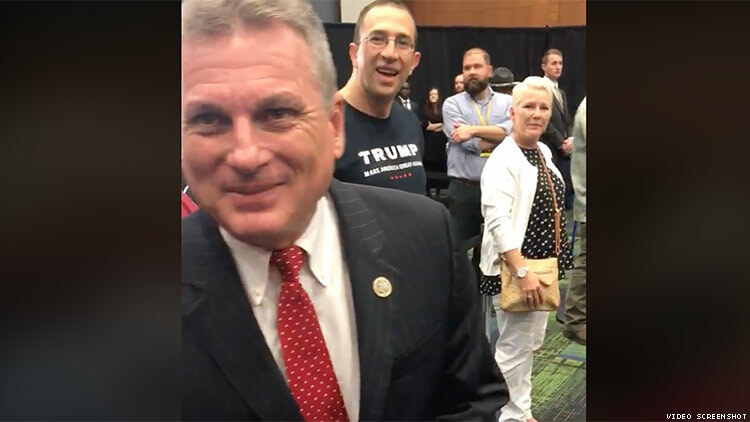 The activists, who held signs reading “Hell Is a Place on Earth,” were almost immediately booted from the event after Republican Congressman Buddy Carter recognized them from a campaign barbecue they had previously protested. “Good to see y’all again. Enjoyed having y’all the other night. Did you enjoy the barbecue?” Carter taunted in footage that has been posted on Facebook. Carter supports the transgender military ban and other anti-LGBTQ measures, while Kemp has endorsed discrimination against LGBTQ people in the name of religious freedom. Pence's homophobic and transphobic views are well-known. “What do you think about trans people?” asked Rainé Eliza, a trans activist. Carter walked away, refusing to comment, and a state trooper arrived and threatened that if the activists stayed, they would be arrested for trespassing. While exiting, the activists chanted “You cannot erase trans people," responding to a memo circulating in the Trump administration that seeks to define gender so that trans and gender-nonconforming people are not recognized by federal law. In response, a man in a "Gays for Trump" T-shirt announced, "I'd love to, though." Carter is the incumbent in Georgia's First Congressional District. Democrat Lisa Ring is challenging him in Tuesday's election. Kemp is running against Democrat Stacey Abrams.